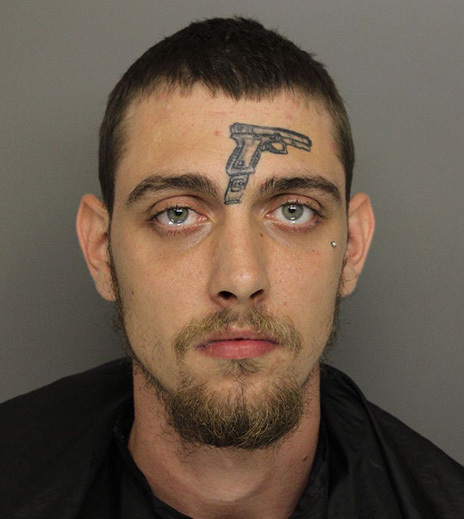 A South Carolina man who has a giant gun tattooed on his forehead has been charged with weapons possession after he was spotted disposing of a firearm following a car crash, cops report. Michael Vines, 24, was collared Saturday evening after slamming a Toyota Camry into a power pole near an intersection in Greenville. Firefighters responding to the crash site told police that they saw Vines toss a handgun into the grass. Officers subsequently recovered a loaded Smith & Wesson .38-caliber revolver from the area where firefighters said Vines discarded the weapon. Vines, a convicted felon, is barred from possessing a firearm. His rap sheet includes multiple narcotics convictions. In addition to a weapons count, Vines was charged with reckless driving and driving with a suspended license in connection with the recent crash.